Fall Cooking Program Registration Time! It’s that time of year again … Fall Registration! Time to start preparing for some tasty treats and hearty fall food in our Creative Chefs with Caregiver and Gourmet Veggies Programs. Registration starts on Saturday, September 9th, 2017 at 7 am! You can check out more information on our cooking programs here. For registration information check out the City of Toronto’s FUN Guide Registration webpage. We also have a free Youth Vegetarian Cooking workshop happening on Saturday, September 30th, 2017. Youth can learn about cooking great vegetarian recipes while helping us prepare for Harvest Fest on Sunday, Oct. 1st, 2017! Please note you must register for this program through the City’s FUN Guide Registration process. For more information check out our cooking programs page. We look forward to cooking with you this Fall! We know it’s tough thinking about March Break when plans for the holiday season are just warming up but it’s that time again! Registration starts tomorrow, Saturday, Dec. 3rd at 7 am. Spaces are limited so please make sure you start early! March Break Eco Camp Page. Good luck to all and we hope to see your campers at Eco Camp in March! The snow will melt, the snow will melt, the snow will melt … Spring is officially here and that means it’s time to get ready to garden! It’s also time to book your curriculum-linked Spring School Program! We’re so excited that even that little bit of snow couldn’t get us down while we’re getting ready to plant. Peas, greens, brassicas (that family of green veggies we’re all encouraged to eat like broccoli, Brussels sprouts, cabbage, collards, cauliflower, kale and kohlrabi), peas, radishes and beets all like a cooler growing season and can even take a little frost. Of course the chives and lemon balm have already poked their heads above the soil. As has one of our favourite spring veggies … sorrel. It’s one of those sour greens but with a green apple zing to it so it peps up your salad without leaving a bitter after-taste. Bring your class our for a morning or afternoon session at the Children’s Garden. Hands on activities can include planting, watering, compost maintenance, worm holding & feeding (aka checking out the vermicomposter), games and more. There’s always so much to do in the garden during spring. Your class will have fun while learning about soil, plants, animals, insects and organic gardening. Half-day and full-day programs are available. Combine 2 half day programs to make a full day in High Park. Click here for more information. Spring is also a great time to get out and explore nature as everything wakes up from it’s long winter’s nap. Many trees and plants will start to bloom soon, birds start chirping their songs, and bugs and insects start to buzz. The City of Toronto’s Parks and Ravines are a great place to go for a hike and explore nature in an urban setting. To dig deeper into the mysteries of urban nature in Toronto check out the Biodiversity Booklet Series. Have an energetic class? 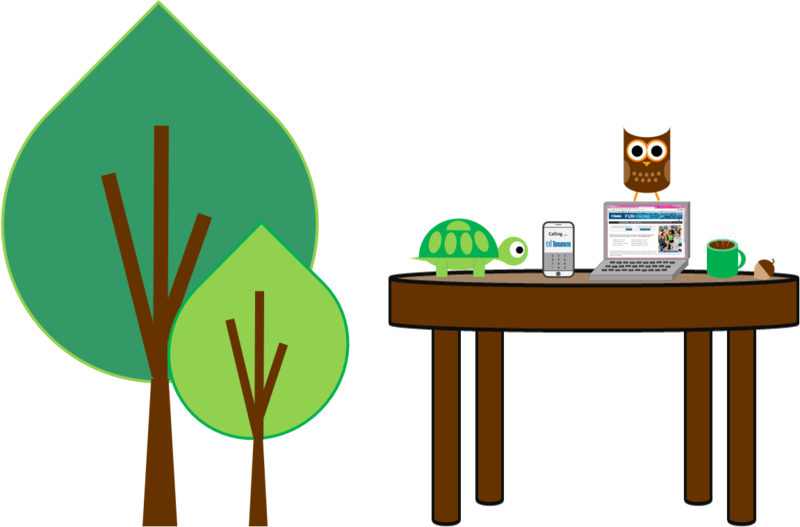 A hike program is a perfect way to focus that energy while learning about habitats, animals, plants, soil, rocks, weather and more. There are plenty of hands on activities students will enjoy like plant and animal Identification, storytelling, nature-based science experiments, games, orienteering and more. Half-day and full-day programs are available. Combine 2 half day programs to make a full day in High Park. Click here for more information. Now that spring has graced us with it’s presence that means fresh fruits and veggies start growing in our garden. This means we get to incorporate them in our cooking programs. Fresh lettuce and sorrel for salads, kale for kale chips, chives to add flavour to our whole-grain cheddar biscuits and now we’re hungry just thinking about it! Bring your class out for one of our healthy cooking programs. Not only will they make something tasty to eat, they’ll brush up on their fractions while their at it! Baking is one of the best, hands-on activities to help review fractions with students. There’s even a reward at the end when they get it right. Other hands on activities include harvesting, estimating & measuring the volume of ingredients, food mapping, safe kitchen practices (including knife handling for older grades), vegetable & fruit identification and more. Half-day and full-day programs are available. Combine 2 half day programs to make a full day in High Park. Click here for more information. 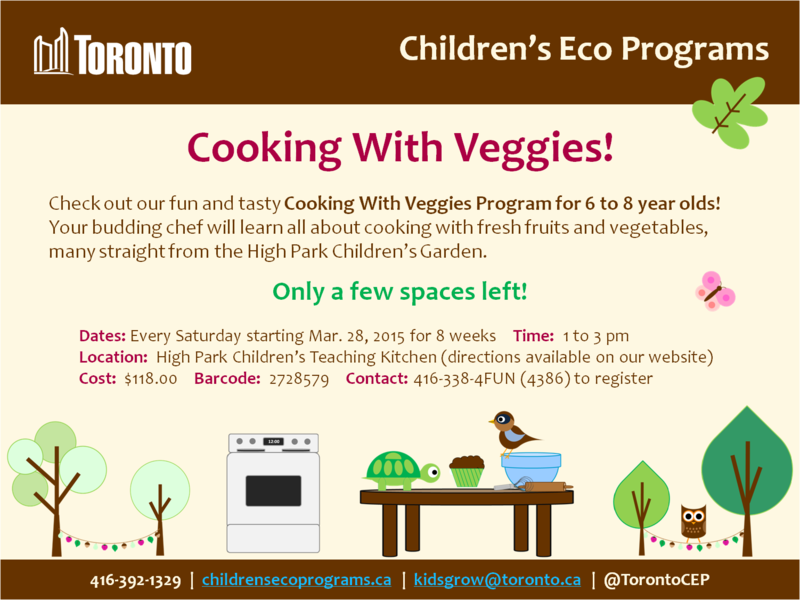 Spots fill-up quickly so book now for your chance to enjoy a little spring in High Park with your students! UPDATE: Cooking Classes will go ahead as planned Saturday, February 20th, 2016. We look forward to seeing you there! Our Cooking Classes are still a go tomorrow, however, just to be on the safe side if there is a labour disruption with CUPE 79 classes will be cancelled. For more information click here for the City of Toronto’s Contingency Plan. Click here to find out how to register. A Few Spaces Left in our Spring Programs! Throughout the fall, winter and spring we offer a variety of curriculum based Environmental Education Programs for students from JK though Secondary School. Our programs offer hands on activities that immerse students in nature through organic gardening, hiking, and cooking with fresh fruits and vegetables. 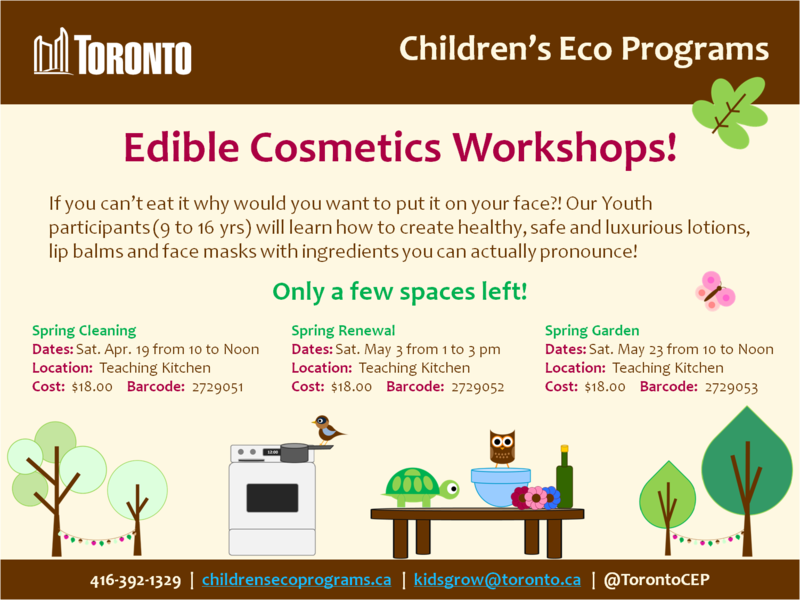 Hiking and cooking programs can be booked throughout the school year but Children’s Garden Programs are only available in May/June and September/October. Check out our program brochures by clicking on a link below.